The seemingly infinite extension of adolescence in modern Western life has long been noted. A number of scholars and popular authors have written books on the subject. The short version: kids never grow up. They are 35 years old, living with their parents, with few comittments, lots of leisure, the focus of attention, and profoundly uphappy. The Death of the Grownup. The newest one The Case Against Adolescence: Rediscover the Adult in Every Teen may be the most extreme and emphatic of the bunch. I really like the bits I’ve picked up from an interview of the author Robert Epstein in Psychology Today. In every mammalian species, immediately upon reaching puberty, animals function as adults, often having offspring. We call our offspring “children” well past puberty. The trend started a hundred years ago and now extends childhood well into the 20s. The age at which Americans reach adulthood is increasing — 30 is the new 20 — and most Americans now believe a person isn’t an adult until age 26. Imagine what it would feel like–or think back to what it felt like–when your body and mind are telling you you’re an adult while the adults around you keep insisting you’re a child. This infantilization makes many young people angry or depressed, with their distress carrying over into their families and contributing to our high divorce rate. It’s hard to keep a marriage together when there is constant conflict with teens. We have completely isolated young people from adults and created a peer culture. We stick them in school and keep them from working in any meaningful way, and if they do something wrong we put them in a pen with other “children.” In most nonindustrialized societies, young people are integrated into adult society as soon as they are capable, and there is no sign of teen turmoil. Many cultures do not even have a term for adolescence. But we not only created this stage of life: We declared it inevitable. In 1904, American psychologist G. Stanley Hall said it was programmed by evolution. He was wrong. For the first time in human history, we have artificially extended childhood well past puberty. Simply stated, we are not letting our young people grow up. Through most of human history, our ancestors began to produce children shortly after puberty, just as the members of all nonhuman species do to this day. Whether we like the idea or not, our young ancestors must have been capable of providing for their offspring, defending their families from predators, cooperating with others, and in most other respects functioning fully as adults. If they couldn’t function as adults, their young could not have survived, which would have meant the swift demise of the human race. The fact that we’re still here suggests that most young people are probably far more capable than we think they are. Somewhere along the line, we lost sight of–and buried–the potential of our teens. When and why did this happen, and what were the consequences? In recent surveys I’ve found that American teens are subjected to more than 10 times as many restrictions as mainstream adults, twice as many restrictions as active-duty U.S. Marines, and even twice as many as incarcerated felons. Nothing illustrates our modern attitude to adolescence as much as our reaction to child labor. In much of the developing world today, children work. Here is a fellow I met in India, who, like millions others, works all day doing the work which adults do. As a suburban American kid myself when I took this picture (well I was in my 20s, but that is the point) I was amazed at what kids elsewhere could and did do. Here of course the chapati maker is in danger of getting burned from a very hot open fire. There’s no way I’d let my own kids get that close. And this is the problem. 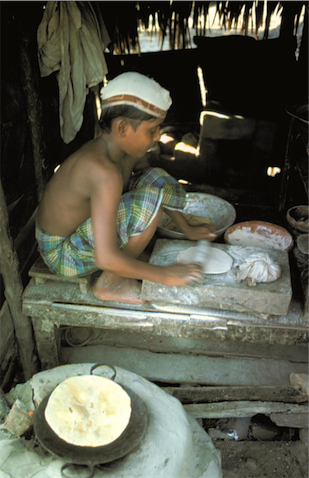 A problem made more difficult because many — if not most — of the kids making chapatis, say, have no choice. They work because their parents need them, or because they are servants, or because they are enslaved. They would much rather be in school and living the life of an extended adolescent. And who would not? The only safe thing we can say, is they grow up very fast, and show without a doubt that adolescent-age kids CAN accomplish most of what adults do. Are American teens really infantilized? Diane Dumas and I approached this issue recently by asking a hundred teens between thirteen and seventeen in seven locations around the United States (three in California, one in Florida, one in Tennessee, one in Texas, and one in Georgia) to complete a checklist of forty-two restrictions that adults–or at least adults who aren’t incarcerated or in the military–virtually never face but that very young children face frequently. (See box, Measuring Infantilization in Teens.) The higher the score, the more restrictions one faces. If you’re over eighteen, when was the last time you were given a “time out” or sent to your room? When were you last forced to undergo medical treatment against your will? When did someone last confiscate your personal property or search your bedroom? When were you last spanked as a punishment for misbehaving? Not recently, I suspect. But our respondents scored surprisingly high on this scale. On average, they had “regularly or routinely” experienced more than twenty-six of these restrictions since they were thirteen, and seventy-four of the teens scored between twenty-two and forty (meaning that the distribution of scores was skewed toward the high numbers). Four of the respondents said they had regularly or routinely experienced forty out of the forty-two restrictions. Again, keep in mind that adults over eighteen (outside of institutional settings or the military) should, in a perfect world, tend to score near zero on this scale. To put those restrictions in perspective, try to envision what a teen’s life was like two hundred years ago. The Industrial Revolution was barely off the ground (the steam engine was invented in England in 1763), and life was largely agricultural. Young people worked side by side with their parents as soon as they were able, as they still do in many countries around the world, and, shortly after puberty, boys often left the family to learn a trade. Couples married and had children young, which made sense considering that the average life span for males was only 38.3 years in 1850. Back to the Pyscology Today interview. I was all the way with Epstein until he was anwser the question of what to do about this squeeze. His answer surprised me, and I have my doubts about the praticallity of testing for competence. Some things can be tested easier than other. What is the competency test for parenthood? What can be done? I believe that young people should have more options–the option to work, marry, own property, sign contracts, start businesses, make decisions about health care and abortions, live on their own–every right, privilege, or responsibility an adult has. I advocate a competency-based system that focuses on the abilities of the individual. For some it will mean more time in school combined with work, for others it will mean that at age 13 or 15 they can set up an Internet business. Others will enter the workforce and become some sort of apprentice. The exploitative factories are long gone; competent young people deserve the chance to compete where it counts, and many will surprise us. It’s a simple matter to develop competency tests to determine what rights a young person should be given, just as we now have competency tests for driving. When you offer significant rights for passing such a test, it’s highly motivating; people who can’t pass a high-school history test will never give up trying to pass the written test at the DMV, and they’ll virtually always succeed. We need to offer a variety of tests, including a comprehensive test to allow someone to become emancipated without the need for court action. When we dangle significant rewards in front of our young people–including the right to be treated like an adult–many will set aside the trivia of teen culture and work hard to join the adult world.